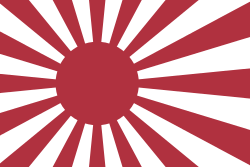 For the Japanese conquest of the Philippines in 1941–1942, see Philippines Campaign (1941–1942). 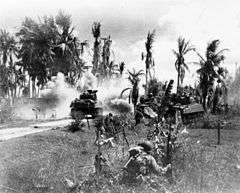 The Philippines campaign of 1944–45, (Operation Musketeer I, II, and III) the Battle of the Philippines 1944–45, or the Liberation of the Philippines was the American and Filipino campaign to defeat and expel the Imperial Japanese forces occupying the Philippines, during World War II. The Japanese Army overran all of the Philippines during the first half of 1942. The Liberation of the Philippines commenced with amphibious landings on the eastern Philippine island of Leyte on October 20, 1944. United States and Philippine Commonwealth military forces were progressing in liberating territory and islands when the Japanese forces in the Philippines were ordered to surrender by Tokyo on August 15, 1945, after the dropping of the atomic bombs on mainland Japan. By mid-1944, American forces were only 300 nautical miles (560 km) southeast of Mindanao, the largest island in the southern Philippines – and able to bomb Japanese positions there using long-range bombers. American forces under Fleet Admiral Chester W. Nimitz had advanced across the Central Pacific Ocean, capturing the Gilbert Islands, some of the Marshall Islands, and most of the Marianas Islands, bypassing many Japanese Army garrisons and leaving them behind, with no source of supplies and militarily impotent. Aircraft carrier-based warplanes were already conducting air strikes and fighter sweeps against the Japanese in the Philippines, especially their military airfields. U.S. Army and Australian Army troops under the American General Douglas MacArthur, the Supreme Commander of the Southwest Pacific Theater of Operations, had either overrun, or else isolated and bypassed, all of the Japanese Army on New Guinea and the Admiralty Islands. Before the invasion of the Philippines, MacArthur's northernmost conquest had been at Morotai in the Dutch East Indies on September 15–16, 1944. This was MacArthur's one base that was within bomber range of the southern Philippines. U.S. Navy, Marine Corps, and Army as well as Australian and New Zealand forces under the command of Admiral Nimitz and Admiral William F. Halsey, Jr. had isolated the large Japanese South Pacific base at Rabaul, New Britain, by capturing a ring of islands around Rabaul, and then building air bases on them from which to bomb and blockade the Japanese forces at Rabaul into military impotence. 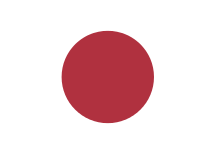 Although Japan was obviously losing the war, the Japanese Government, and the Imperial Japanese Army and Navy, showed no sign of capitulation, collapse or surrender. There had been a close relationship between the people of the Philippines and the United States since 1898, with the Philippines becoming the Commonwealth of the Philippines in 1935, and promised their independence in mid-1946. Furthermore, an extensive series of air attacks by the American Fast Carrier Task Force under Admiral William F. Halsey against Japanese airfields and other bases on the Philippines had drawn little Japanese opposition, such as interceptions by Japanese Army fighter planes. Upon Admiral Halsey's recommendation, the Combined Chiefs of Staff, meeting in Canada approved a decision to not only move up the date for the first landing in the Philippines, but also to move it north from the southernmost island of Mindanao to the central island of Leyte, Philippines. The new date set for the landing on Leyte, October 20, 1944, was two months before the previous target date to land on Mindanao. The Filipino people were ready and waiting for the invasion. 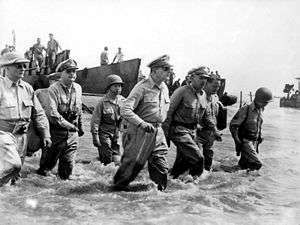 After General MacArthur had been evacuated from the Philippines in March 1942, all of its islands fell to the Japanese. The Japanese occupation was harsh, accompanied by atrocities and with large numbers of Filipinos pressed into slave labor. From mid-1942 through mid-1944, MacArthur and Nimitz supplied and encouraged the Filipino guerrilla resistance by U.S. Navy submarines and a few parachute drops, so that the guerrillas could harass the Japanese Army and take control of the rural jungle and mountainous areas – amounting to about half of the archipelago. While remaining loyal to the United States, many Filipinos hoped and believed that liberation from the Japanese would bring them freedom and their already-promised independence. The Australian government offered General MacArthur the use of the First Corps of the Australian Army for the Liberation of the Philippines. MacArthur suggested that two Australian infantry divisions be employed, each of them attached to a different U.S. Army Corps, but this idea was not acceptable to the Australian Cabinet, which wanted to have significant operational control within a certain area of the Philippines, rather than simply being part of a U.S. Army Corps. No agreement was ever reached between the Australian Cabinet and MacArthur – who might have wanted it that way. As a result, the Australian Army played virtually no part in the Philippines. However, units from the Royal Australian Air Force and the Royal Australian Navy, such as the heavy cruiser HMAS Australia were involved. During the American re-conquest of the Philippines, the guerrillas began to strike openly against Japanese forces, carried out reconnaissance activities ahead of the advancing regular troops, and took their places in battle beside the advancing American divisions. On October 20, 1944, the U.S. Sixth Army, supported by naval and air bombardment, landed on the favorable eastern shore of Leyte, one of the islands of the Visayas island group, northeast of Mindanao. The Japanese miscalculated the relative strength of the naval and air forces, and they attempted to destroy the landing. This brought about the massive sequence of battles called the Battle of Leyte Gulf, fought on October 23 through October 26. This decisive victory by the U.S. Navy, its Fast Carrier Task Force, its surface fleet, and its submarines effectively destroyed the remainder of the Imperial Japanese Navy (IJN), which had already lost all of its effective aircraft carrier forces. The IJN had four of its carriers sunk (ships with depleted air squadrons – which were used only as decoys), numerous battleships and heavy cruisers, and a large number of light cruisers and destroyers. The IJN was never able to fight a major battle after this. The U.S. Sixth Army continued its advance from the east, as the Japanese rushed reinforcements to the Ormoc Bay area on the western side of the island. While the Sixth Army was continually reinforced, the U.S. Fifth Air Force was able to devastate the Japanese attempts at air attacks, and also provide much support to the Army's ground troops. The Filipino guerrillas also performed valuable service in maintaining public order and in keeping the roads and highways free of congestion. After the American beachheads were established, the Leyte guerrilla groups were attached directly to the Sixth Army corps and divisions to assist in scouting, intelligence, and combat operations. With the initial U.S. Sixth Army landings on the beaches at Tacloban and Dulag, Colonel Ruperto Kangleon's units went into action. They dynamited key bridges to block Japanese displacement toward the target area; they harassed enemy patrols; and they sabotaged supply and ammunition depots. Information on enemy troop movements and dispositions sent from guerrilla outposts to Kangleon's Headquarters was dispatched immediately to Sixth Army. During many torrential rains and over difficult terrain, the advance continued across Leyte and onto the major island of Samar, just north of Leyte. On December 7, 1944, the U.S. Army units made another amphibious landing at Ormoc Bay and, after a major land and air battle, the landing force cut off all Japanese ability to reinforce and resupply their troops on Leyte. Although fierce fighting continued on Leyte for months, the U.S. Army was always in control. The U.S. 6th Army's second major target to attack was Mindoro. This large island is directly south of Luzon and Manila Bay, and MacArthur's main goal in taking it was to be able to construct airfields on it for fighter planes that could dominate the sky over the most-important island of Luzon, with its major seaport and capital city of Manila. The Seventh Fleet's large invasion convoy from Leyte to Mindoro came under strong attack by kamikazes, but they could not delay the American invasion of Mindoro. Mindoro was only lightly occupied by the Japanese Army, and much of it was held by Filipino guerrillas, so Mindoro was quickly overrun. U.S. Army engineers set about rapidly constructing a major air base at San Fabian. Besides being close to Luzon, Mindoro has another advantage: good flying weather nearly all the time, because this is a part of the Philippines that is relatively dry – quite unlike Leyte which receives torrential rains most of the year, not only giving it poor flying weather, but making it very muddy and difficult to construct airfields. San Fabian was also the location of another breakthrough: the first appearance during the War in the Pacific of USAAF squadrons flying the fast, long-range P-51B Mustang fighters – far superior to anything that the Japanese Army or Navy had. Mindoro was a major victory for the 6th Army and the USAAF, and it also provided the major base for the next move of MacArthur's 6th Army: the invasion of Luzon, especially at Lingayen Gulf on its western coast. Despite initial optimism, fighting in Manila was harsh. It took until March 3 to clear the city of all Japanese troops, and the Japanese Marines, who fought on stubbornly and refused to either surrender or to evacuate as the Japanese Army had done. Fort Drum, a fortified island in Manila Bay near Corregidor, held out until April 13, when a team of Army troops went ashore and pumped 3,000 gallons of diesel fuel into the fort, then set off incendiary charges. No Japanese soldiers in Fort Drum survived the blast and fire. Palawan Island, between Borneo and Mindoro, the fifth largest and western-most island of the Philippines, was invaded on February 28, with landings of the Eighth United States Army at Puerto Princesa. The Japanese put up little direct defense of Palawan, but cleaning up pockets of Japanese resistance lasted until late April, with the Japanese using their common tactic of withdrawing into the mountains and jungles, dispersed as small units. Throughout the Philippines, U.S. forces were aided by Filipino guerrillas to find and dispatch the holdouts, the last of whom, Hiroo Onoda, did not surrender until 1974, in the mountains of Lubang Island in Mindoro. The U.S. Eighth Army then moved on to its first landing on Mindanao (April 17), the last of the major islands of the Philippines to be taken. Mindanao was followed by invasion and occupation of Panay, Cebu, Negros and several islands in the Sulu Archipelago. These islands provided bases for the U.S. Fifth and Thirteenth Air Forces to attack targets throughout the Philippines and the South China Sea. Following additional landings on Mindanao, U.S. Eighth Army troops continued their steady advance against stubborn resistance. By the end of June, the enemy pockets were compressed into isolated pockets on Mindanao and Luzon where fighting continued until the Japanese surrender on August 15, 1945. However, some units of the Japanese Army were out of radio contact with Tokyo, and it was difficult to convince some of them that Japan had surrendered. As at many Pacific Islands, major Japanese officials, including members of the Imperial Family, visited in person to convince the soldiers that they must surrender by order of the Emperor. ↑ "World War II: Mexican Air Force Helped Liberate the Philippines". History.net. June 12, 2006. Retrieved June 12, 2015. ↑ Schmidt 1982 Retrieved October 22, 2015. 1 2 3 Tucker, Spencer (2012). Almanac of American Military History, Vol. 1. ABC-CLIO. p. 1668. ISBN 978-1-59-884530-3. ↑ According to the National World War II Museum, Filipino military deaths during the war numbered 57,000. A significant portion must have fallen in the 1944–45 campaign. ↑ American Historical Association: Lessons from Iwo Jima Retrieved November 13, 2015. ↑ "Edward Price Ramsey: Lieutenant Colonel (Retired), 26th Cavalry Regiment (Philippine Scouts)". militarymuseum.org. Retrieved December 1, 2015. ↑ Macarthur, Douglas (1966). "Guerrilla Activities in the Philippines: The Philippine Resistance Movement". Reports of General MacArthur: The Campaigns of Macarthur in the Pacific. Volume I. Washington, D.C.: Center for Military History, US Army. pp. 316–318. OCLC 254218615. ↑ "Chapter IX: The Mindoro and Luzon Operations". Reports of General MacArthur: The Campaigns of MacArthur in the Pacific: Volume I. Library of Congress: Department of the Army. pp. 242–294. Retrieved January 5, 2014. ↑ "Chapter IX: The Mindoro and Luzon Operations". Reports of General MacArthur: The Campaigns of MacArthur in the Pacific: Volume I. Library of Congress: Department of the Army. p. 247. Retrieved January 5, 2014. ↑ Chambers, John Whiteclay; Fred Anderson (1999). The Oxford companion to American military history. New York City: Oxford University Press US. p. 547. ISBN 978-0-19-507198-6. Retrieved May 7, 2011. ↑ MacArthur, Douglas (1994). Reports of General MacArthur. United States Army. p. 445. LCCN 66-60005. Retrieved August 15, 2014. The radio also stated that members of the Imperial family were being sent to Japan's numerous theaters of operations as personal representatives of the Emperor to expedite and insure full compliance with the Imperial order to cease hostilities. Wikimedia Commons has media related to Philippines Campaign (1944–45). "Chapter IX: The Mindoro and Luzon Operations". Reports of General MacArthur: The Campaigns of MacArthur in the Pacific: Volume I. Library of Congress: Department of the Army. pp. 242–294. Retrieved January 5, 2014. Morison, Samuel Eliot (2001). The Liberation of the Philippines: Luzon, Mindanao, the Visayas 1944–1945, vol. 13 of History of United States Naval Operations in World War II (Reissue ed.). Castle Books. ISBN 0-7858-1314-4.